Pierre Huyghe, Untilled (2011-2012). Courtesy dOCUMENTA (13). Photo: Nils Klinger. Pierre Huyghe's project Untilled (2011-12) in the Karlsaue park is a space for composting, a matrix for worlding together through an alliance between art, living organisms and things, where culture becomes cultures, including the biological sphere. The set of operations that occurs between all these elements has no script. There are antagonisms, associations, hospitality and hostility, corruption, separation and degeneration, or collapse with no encounters. There are circumstances and deviations that allow the emergence of complexities. Untilled includes the participation of "Human," a 2 year old female Podenco Ibencico found homeless on the streets of Spain. 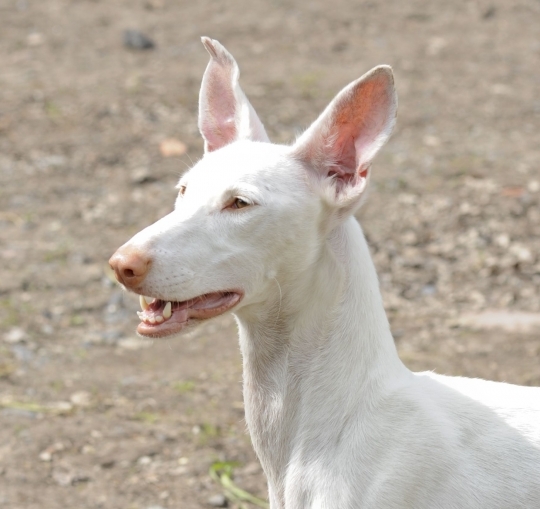 Podenco Ibencico dogs are a special breed originally bred in Spain to hunt rabbits. It has been a common practice for Podenco dogs to be kept undernourished in order that they be more effective as hunters. Through an organization that is dedicated to finding homes for homeless dogs, "Human" was adopted by the caretaker of Pierre Huyghe's project for dOCUMENTA (13), who has given her a new home in Kassel. Since "Human" arrived in Germany a few months ago, she has gained 5 kilograms. She continues to gain weight and, under the supervision of a veterinary consultant (FVO), she is in good health and continues to make progress. She is cared for with affection and knowledge and both she and her owner regularly attend weekly training sessions on dog and human relations. "Human" comes to the park every morning with the caretaker to spend her day in the park and returns nightly to their home. We are confident "Human" is enjoying her new life in the Karlsaue. Since time immemorial non-human live animals have been participating in human activities, recently including cultural forms such as art, theater and film. In the twentieth century, animal rights movements emerged to protect animals from such contexts of spectacle and exploitation. dOCUMENTA (13) believes it is not what you do, but how you do it, that forms the basis of the ethics of such relations. From this point of view dOCUMENTA (13) encourages thinking through our multispecies collaborations. The ethics of relations between species is a debate has traversed the contemporary art field for years. The Worldly House, located in the Karlsaue park as part of dOCUMENTA (13), hosts an archival project dedicated to multispecies co-evolution that examines and hopes to reshape links among living creatures, both human and non-human.